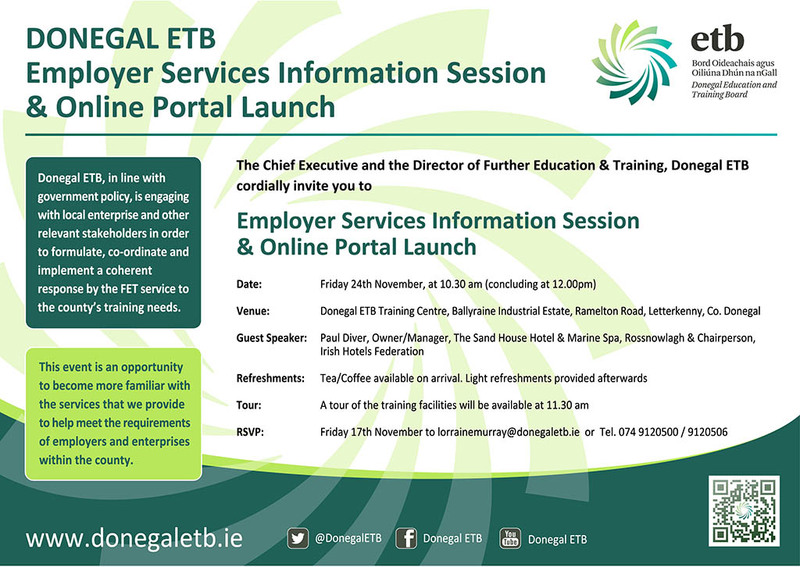 Donegal ETB will launch the Employer section of our Website on Friday 24 November in the Donegal ETB Training Centre, Ballyraine Industrial Estate, Letterkenny. All employers and relevant stakeholders are welcome to attend the event which will include an opportunity to engage on a tour of the centre to view the excellent training facilities available and to meet with instructors/tutors and learners. For further information on this event please contact Lorraine Murray on 074 91 20506/087 9320353. Our annual FET Fair takes place on Wednesday 24 January in Letterkenny (venue to be confirmed) from 11.00am-3.00pm. Join the 1,000 adults who attend every year to find out more about the courses and training services we and other education providers can provide. For further information contact our Adult Learner Guidance Service on 074 91 78088.